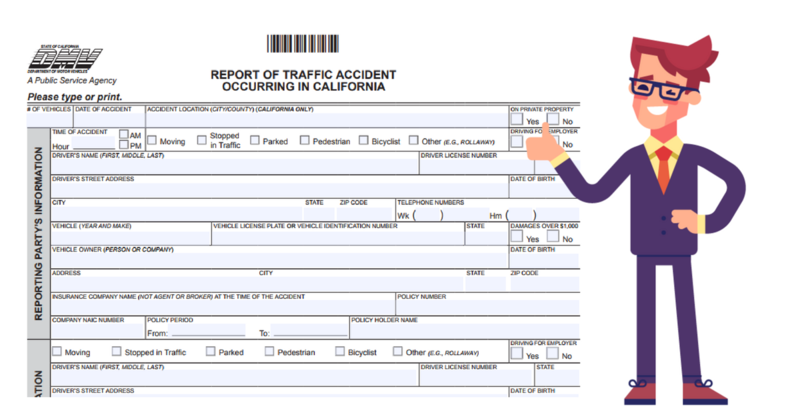 Many of our clients are unaware of the fact that if you are in a major car accident in the state of California, you are required by law to fill out an SR-1 form with the DMV within ten days of a major accident. Whether or not you were at fault in the accident. Whether or not you had the proper auto insurance. Whether or not your license and vehicle registration were up to date. Even if the police responded to the accident, and filed an accident report. Filing an SR-1 form is required whenever you have been an accident where anyone has been injured or killed (even if the injuries are minor), or property damage exceeds $1,000. If there were no injuries, and property damage was below $1,000, then you’re in the clear. 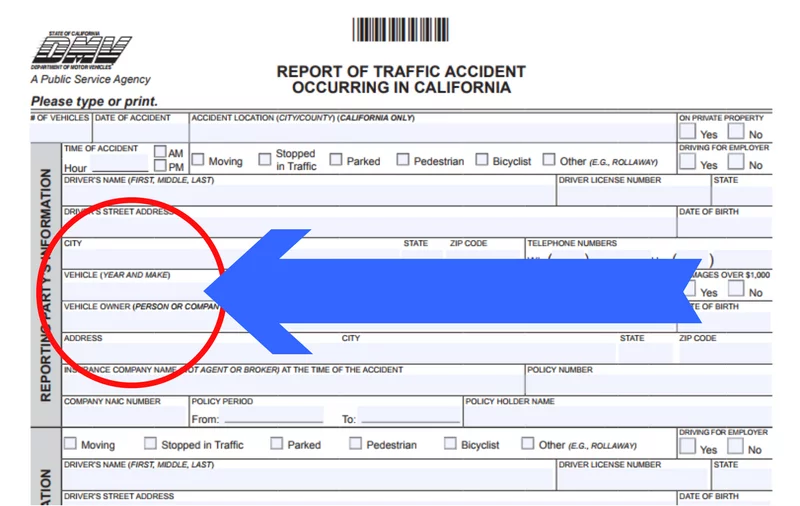 An SR-1 must be filed whenever an accident of this severity occurs anywhere within the state of California, even if it occurs on a private road or driveway. You must include your own contact information, including your name, address, and phone number, your vehicle information, and your driver’s license number. You must also include the other party’s information, as well as when and where the accident took place, and what kind of accident it was. Finally, you must include information about the injuries, deaths, or property damage that occurred in the accident, and the insurance information for your vehicle. If possible, it’s advisable to consult with an attorney when filling out the form. An experienced attorney’s input will ensure that your description will not open you to unnecessary liability. Click here for a copy of the SR-1 form. Filing an SR-1 might seem like a completely unnecessary administrative hurdle, especially since you must already report the accident to the police and your insurance. But there’s a good reason for it. Although every driver in California is supposed to have auto insurance, some do not. The SR-1 form provides evidence when an uninsured driver has an accident, which is important to the other driver for insurance reasons. To make an uninsured motorist (UM) claim, you will need to file another form, the SR-19C. What Happens If I Didn’t File an SR-1? You should file an SR-1 within ten days of an accident. But if you didn’t, you might still have a chance to redeem yourself in the eyes of the almighty DMV. The DMV doesn’t know about the accident unless an SR-1 was filed by another driver. But you should file your SR-1 anyway; don’t count on the other driver forgetting. After the other driver has filed an SR-1, and if you still have not done so, the DMV will likely send you a letter reminding you to file an SR-1 of your own. If you have received such a letter, then you must file an SR-1 as soon as possible. Of course, enforcement of these policies may vary, so it’s best to be safe. Does Filing an SR-1 Mean That I Was at Fault? No. An SR-1 is not an admission of fault. It is merely a notification to the DMV that an accident occurred, and it says nothing about who or what caused that accident. Fault is determined by the insurance companies. An SR-1 won’t give them anything to use against you. However, if you fail to file an SR-1, then you may find yourself in trouble with the DMV. If you have any further questions about filling out an SR-1, speak to a personal injury attorney, who can also give you useful legal advice about your auto accident claim.